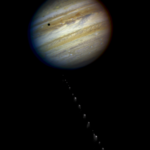 In July 1994, comet Schoemaker-Levy 9 (SL9) spectacularly impacted Jupiter. As comets are water-rich bodies, the detection of water in Jupiter’s stratosphere in 1997 by the Infrared Space Observatory (Feuchtgruber et al. 1997) was suggestive of the cometary origin of the observed water. 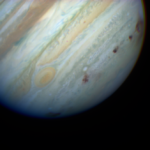 (le ft) Jupiter and comet Shoemaker-Levy 9 fragments. (right) scars in Jupiter’s atmosphere caused by the comet impacts. However, more than a decade of observations with SWAS, Cassini, and Odin could provide us with additional hints (Lellouch et al. 2002, 2006, Cavalié et al. 2008, 2012), but no formal proof. We have mapped the water emission of Jupiter with Herschel in 2009-2010 with its HIFI and PACS instruments. The spatial resolution combined with the very high spectral resolution of our observations prove that the bulk of Jupiter’s stratospheric water was deposited by comet SL9 in 1994. There is indeed an overabundance of water in the southern hemisphere of the planet, i.e. the impacted hemisphere, and the altitude level of residence of water is only compatible with what is expected from the temporal evolution after such an impact. The stratospheric water of Jupiter thus originates from the comet Shoemaker-Levy 9. 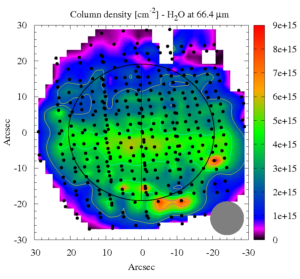 Spatial distribution (in terms of column density) of water in Jupiter’s stratosphere as observed with Herschel. The overabundance seen in the southern hemisphere is reminiscent of the impacts of comet SL9 in 1994 in this same hemisphere. Reference: Cavalié et al. 2013, Astronomy and Astrophysics 553, A21.